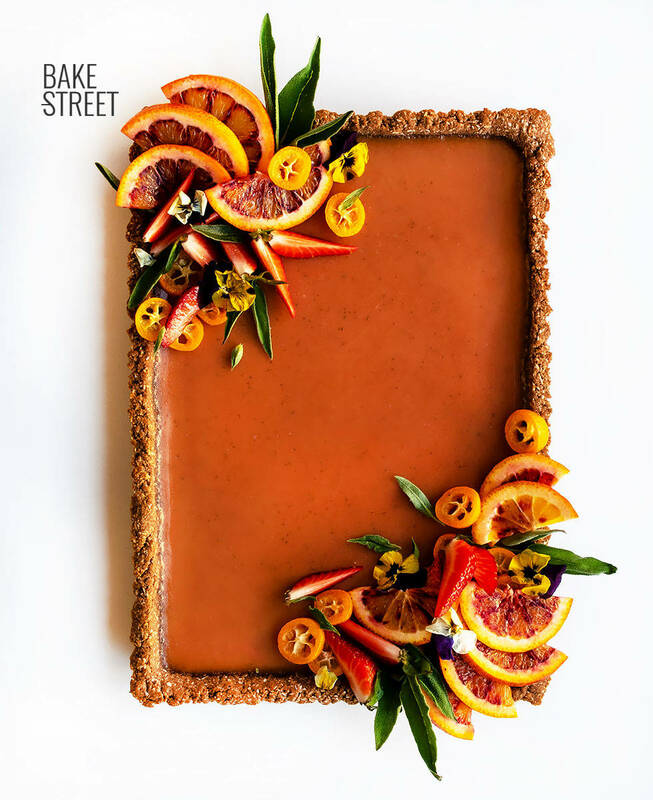 I’ve been wanting to make this tart since blood orange season began… And if I get distracted, I have to leave it for next year! It’s been a long time since I left you a tart of this type, with a creamy filling and a simple base. The truth is that it’s a very attractive and fresh option, especially when the weather is good. 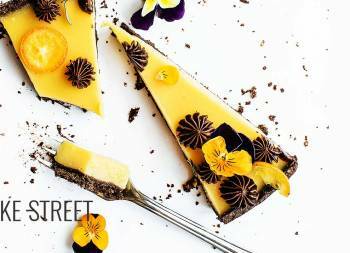 So today I leave you how to prepare this Blood orange, sage and tamarind tart. Whenever I prepare this type of pie, I like to combine at least 3 ingredients that are part of the filling. 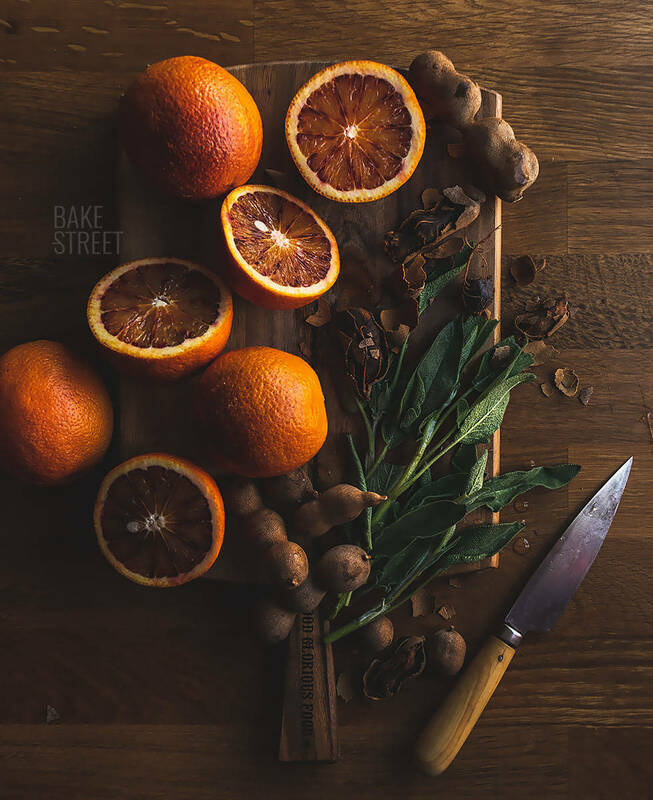 In addition to those necessary to carry it out as eggs, sugar, gelatin … What was clear to me was that the main base was going to be blood orange juice, so I was looking for citrus and sweet flavors. 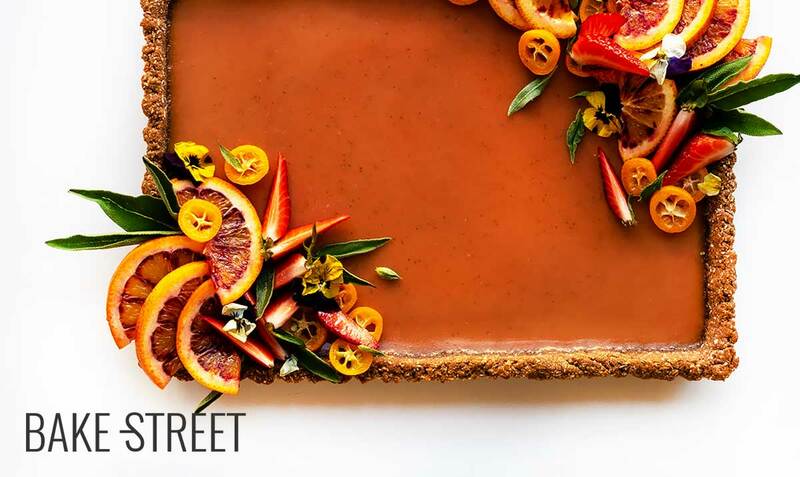 Preparing the blood orange, sage and tamarind tart. 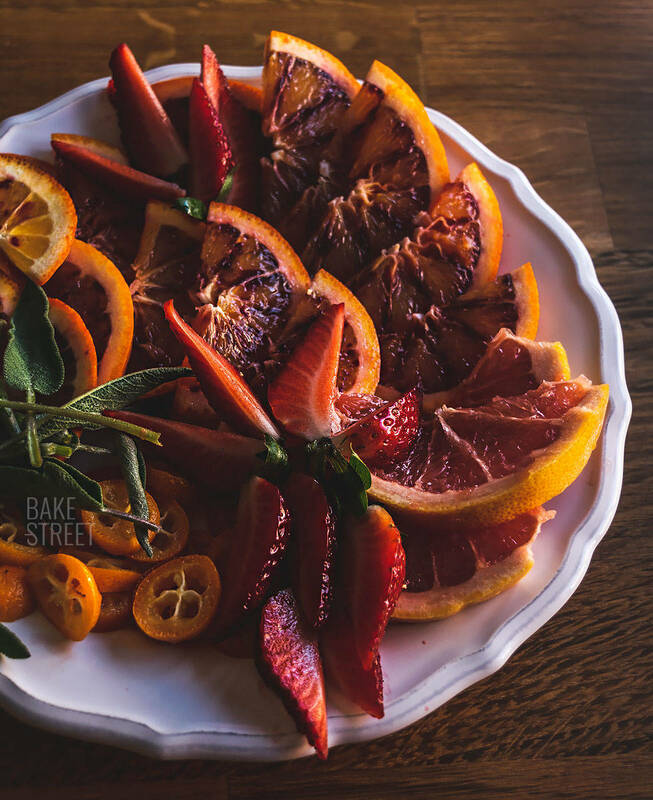 Blood oranges have a citrus taste, but mainly sweet. I wanted to maintain that line, but with flavours that stand out and are not hidden. So I thought about tamarind. I love tamarind, it’s one of the fruits that hasn’t been missing in my house for a long time. In fact, in the fridge I have a big glass jar with them inside so I can use them whenever I want. If you keep them that way, they will be well for a long time. The taste of tamarind is citrus and sweet, but different from blood orange. I thought it would go very well, and it certainly did. If you’ve never tried it before, do it. It is an ingredient that combines very well in both sweet and salty, in this link you can see more recipes where I have used it. I also wanted to add some aromatic herbs, but some that were different from other more common ones such as basil, mint, peppermint … And then I thought of sage. Another fantastic herb that gives wonderful aromas. With it we will achieve a subtle spicy flavor and touches that remind us of eucalyptus and pine. It’s true that I don’t always have this herb at home, I use it from time to time. But when I go for it, I buy a very big box and I take advantage to prepare many recipes. And if I still have a surplus, I prepare sage and hazelnuts pesto. I also added another ingredient that I don’t mention in the title, but that helps to carry a bit of natural color as well as sour and acid shades. And this is the hibiscus flower. I add it at the end of the cream cooking and let it infuse while reducing the temperature of the cream to add the gelatin. Here you can make the base that you like, only taking into account the one that can combine well with the flavors of the filling. In my case I decided to make a very, very simple base. As much as to mix, to place in the mold and bake only 12 minutes to dry it. I used ground almonds, grated coconut, coconut flour, honey and cocoa powder. Given the color of the filling, I wanted the base to have a chocolate tone, but not a lot of flavor. That’s why I decided to add a little cocoa. But if you don’t like it, all you have to do is omit it and it’s solved. On the blog I have another base made with ground almonds, grated coconut and condensed milk that doesn’t need an oven. Or if you want to make a dough base, like an almond pâte sucrée you can see it in this post. You can also prepare a base with nuts, seeds, sweeten it with dates, raisins, apricots… The possibilities are infinite and wonderful all of them. This is undoubtedly one of the parts I like the most. I love to decorate cakes and pies, that’s where I can finish giving my personal touch to what I’m preparing. In fact in the decoration, you can use other elements that are not part of the filling, but that combine well in terms of flavor and color. 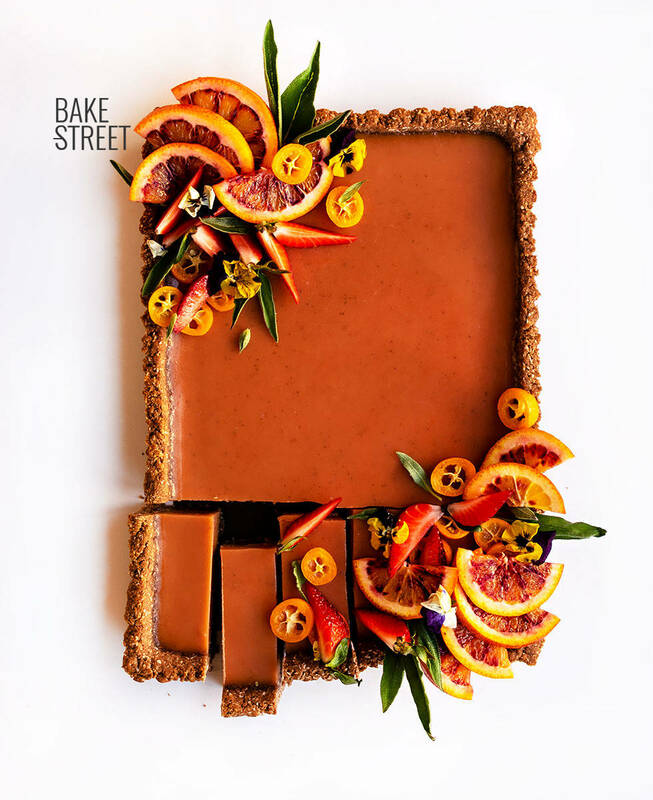 I chose to use blood orange (this could not be missing), strawberries, sage leaves, kumquats and flowers. But feel free to decorate it as you like and with the ingredients you have at home or at your fingertips. Make coconut and almond base. In a large bowl add the ground almond together with the grated coconut, the coconut flour and salt. Mix with a spoon. Add the honey together with the coconut oil and start to integrate the ingredients. We will have to work a little with our hands to get the ingredients to amalgamate. Incorporate the cocoa powder and mix. Add the water little by little and integrating at the same time. We will have to get a dough that does not break but without exceeding when hydrated. Transfer the mixture to the mold. We will do it in small portions and we will be adjusting the mixture to this one, so much the base as the lateral ones. Once we have all the mixture distributed, help ourselves with a small glass, small rolling pin or hands to level the mixture. Bake at medium height for 12 minutes. Remove and place on a rack. Prick the whole base with a fork and let it cool completely. Prepare the blood orange, sage and tamarind cream. Fill a bowl with very cold water and put the gelatin sheets inside to hydrate them. We must do it 15 minutes before using them. Squeeze the blood oranges to obtain the juice. Pour into a blender and add the chopped sage leaves together with the tamarind flesh. Blend until a homogeneous texture is obtained. Set aside. Add the butter in a medium saucepan and heat to medium low. Let it melt completely. Pour the orange juice together with the sugar and eggs. Cook to medium heat without stopping stirring(my vitroceramic hob has position of 1-9, I used the 5), this way we will avoid that it adheres to the bottom of the saucepan and form lumps. Cook stirring constantly until the mixture reaches 181,4ºF/83ºC, for it we will help ourselves with a digital thermometer. It is important that the mixture does not reach boiling point. It will take about 10 minutes, patience. Remove from the heat and add the hibiscus flowers. Mix. Let the mixture stand and reduce its temperature to 131º-122ºF/55º-50ºC. Strain the mixture through a strainer or sieve to remove solids. Drain the gelatine sheets and add to the mixture. Whisk until completely dissolved. Pour over the baked base and place in the fridge. Let it solidify completely, ideally let it rest overnight. 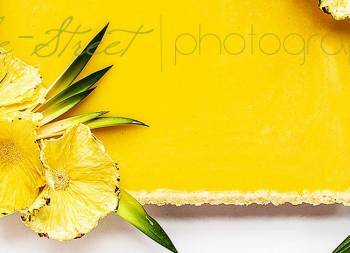 We will decorate the tart just before serving so that the fruit and flowers are fresh. 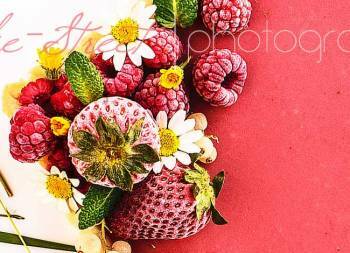 Place blood orange slices, strawberries, sage leaves, slices of kumquats and edible flowers. The base of the tart can be made with ground almond and grated coconut, omitting the coconut flour if you wish. Honey can be replaced by another sweetener, condensed milk, agave syrup, nuts such as dates ... I leave it to your choice. The melting point of coconut oil is 77ºF/25ºC, so at this time of year you should warm it to melt it since its state will be solid. 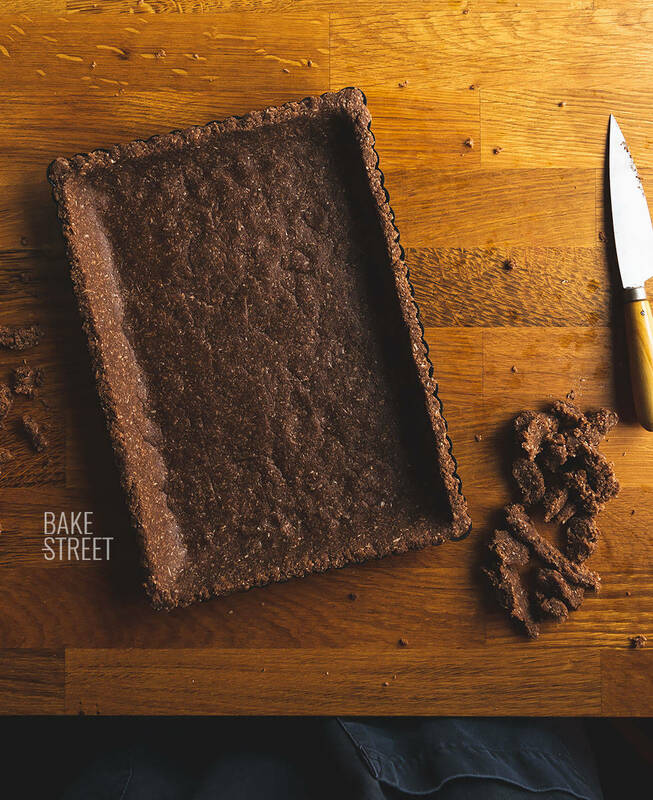 We must bake the base to dry it a little, not because it is necessary to cook the ingredients. But by doing this step, we will improve the texture and finish of the tart. As soon as it comes out of the oven, it is likely that the base is slightly swollen, don´t worry. Pass the lower part of a spoon to smooth it and prick the surface with a fork. This step will also help us to fix the filling better. The amount of sage and tamarind you can adjust to your taste, if you wish. The hibiscus flower will give us a wonderful acid/sour flavor, as well as dyeing the mixture a little naturally. It can be kept in the fridge for 4-5 days. 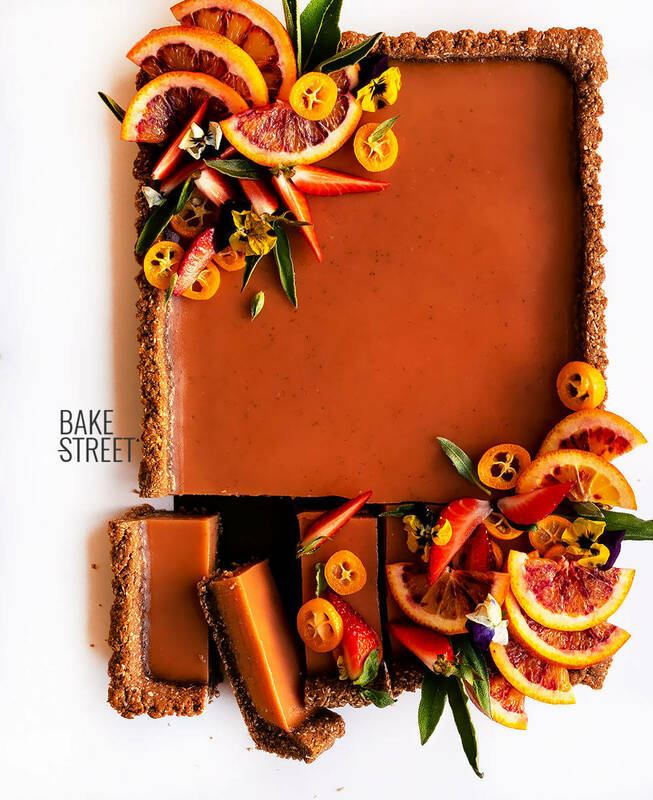 With this Blood orange, sage and tamarind tart I bid you farewell until the return of Easter. We are going to take a few days of rest that we need it! We are not going anywhere in particular, we plan to do trails and routes (I'm practicing landscape photography! ), in addition to taking care of ourselves a little and going out to disconnect and enjoy. But for me, that's more than enough. Especially considering that there have been weeks when I haven't left home for 5 days. Yes, even if you don't believe it. I've had so much work that I've come to be without leaving my house all those days... And now that everything is delivered and done, what I plan to do is not to stop at home within our possibilities, hahaha.